Here’s the thing. A while ago, when the Marc By Marc Jacobs Miss Marc tee shirts came out, I was totally against them. You could even say I was creeped out. A Nighmare-Before-Christmas-esque girl smack dab in the middle of my shirt? No thanks. But my sentiments towards Miss Marc promptly changed when I spotted this Marc By Marc Jacobs Miss Marc Coin Purse. You see, I carry a lot of pens and pencils and colored pencils (really, who knows when I might need them) with me, that student’s curse. 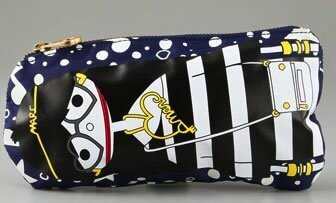 I’m therefore always on the lookout for fun pen pouch to throw in my bag so that I don’t get pen marks on my bag’s lining. And this little purse certainly fits the bill. It’s certainly the right size for my writing utensils, and the fun design ensures that it’ll be found even in a black-lined bag. I know some people won’t agree with me- Miss Marc is certainly an acquired taste. She’s quirky and colorful, and absolutely the quintessential Marc by Marc girl, albeit in cartoon form. You could say I’ve warmed up to her. Who knows, I may start sporting a skinny yellow headband and heart-shaped glasses to cultivate my newfound adoration. Buy through Shopbop for $58.